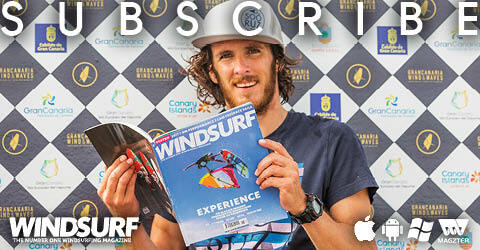 A phenomenon has gripped windsurfing, as it has almost every other watersport. Foiling, although nothing new, has come of age over the last 18 months or so, with most major brands producing a targeted product and many new brands emerging on the scene. 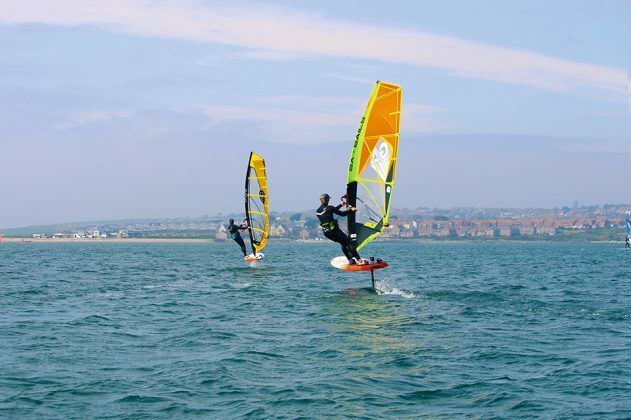 We set our test team the task of trying some of the latest kit available, since they are located at Portland harbour – one of the best windfoil locations in the UK, if not Europe! We chose to look primarily at freeride focussed foils – those designed specifically for the progressing foiler. There is no doubt many of you reading this are keen to give it a go, so these are some of the foils and boards designed to capture your attention, enhance your enthusiasm and provide those first exhilarating flights. This test was originally published in the July 2018 issue. The first thing to point out when looking at foils, more than anything else, is that stiffness is key. There are an incredible number of forces working on the hydrofoil, from many different angles – the flow of the water, the energy transferred from the sail through the mast foot and board; the downward pump from the rider, turbulence in chop, the denser water deeper down … we could go on. It makes it nigh on impossible to model the environment in a computer program, just as it is difficult to model the fluid dynamics around a windsurf sail. And yet, one thing that seems consistent amongst all the brands and the literature they’ve produced is that the stiffer the foil, the less twist, flex or torsion there is and the more stable and predictable the flight. The mast is a prime candidate to potentially exhibit stiffness issues, so for the best performance the default material is carbon or carbon composite, which has its obvious cost drawbacks. To keep costs down, all bar two of the foils here have resorted to aluminium masts instead, with many brands going a step further and reducing the length of the mast (measured from the top of the fuselage to the point the mast meets the hull of the board), to mitigate torsion at the base. From 68cm to 91cm, there are masts of all shapes and sizes here, the larger ones providing more clearance and margin for error, whilst the shorter masts provide a better chance of survival in the event of any accidental breach. The fuselage or strut, (which stems from the bottom of the mast and hosts the wings), has a large influence on the stability and response of the foil’s flight, with lengths varying amongst the group by almost 50cm. A very general rule is that the longer the fuselage, the more stable the foil. The shorter it is, the more immediate its response to input from the rider. That said, there are plenty of other considerations, such as the position of the mast fixture on the fuselage determining the point of lift, or the size and shape of the wings used. Another argument against the longer fuselage is the real-world issue of it pendulum-vibrating at its rearward tip, due to the distance between the mast and rear wing being so great. Time will tell which way the development story unfolds! Again, the majority of the brands here are using aluminium as their choice of fuselage material, satisfied that they can control component stiffness through carefully considered cross sections. The wings are probably the most eye-catching and diverse features of all, with some very different shapes, sizes and materials employed by the brands. From the low aspect (short span, long chord) front wings of Naish and Slingshot, to the high aspect examples of the RRD, Pryde and Manta Foils, there’s a whole case study of designs here. Carbon, for most, is the material of choice, simply due to its stiffness, weight and form flexibility … but it bumps the price up again. Neil Pryde and Manta Foils have opted for G10 glass fibre instead, stripping cost, but being limited by the properties of the material. Their wings must remain flat to ensure durability, so the brands have precisely milled the profiles of their wings to maximise lift efficiency. Be aware, this has made these wings quite sharp along their tips and trailing edges. Play in the fixings and junctions will also dramatically impact upon stiffness and stability, and has clearly been considered long and hard by all brands. There is also one other very important point to consider here, and that concerns maintenance. We all know that the typical windsurfing environment of saltwater and sand (and UV if we’re lucky!) is a highly corrosive one, but there is another reason to step up your conscientiousness, and it concerns the materials used in the foils. The galvanic series determines the likelihood and rate that corrosion will occur when two metals or semi-metals are submerged in an electrolyte. The further apart the materials are in the series sequence (i.e. the difference in their nobility), the faster the rate of corrosion. Now, it just so happens that saltwater is the perfect electrolyte, and that carbon (graphite) and aluminium are at the other ends of the galvanic spectrum from one another! That means that their proximity to one another in foils provides a high voltage potential, whereby electrons pass from the cathode (aluminium in this case) to the anode or electron attractor (the carbon component). Past instances of when this rapid-corrosion phenomenon occurs are too numerous to recount, in both our sport and other sports such as cycling, but take hybrid booms with their carbon tailpieces as a prime example. Leave the boom in the back of your van for a month or so after your last session, and you’d be left scratching your head when your boom could no longer be extended on your next journey to the beach. Lubricants such as Lanolin oil and taping bolts with Teflon are suggested by Slingshot to mitigate the influence of the electrolyte (saltwater). Others brands recommend Tef-Gel – a lubricant regularly used in the marine industry. Whatever you use, rinsing your foil in fresh water after every use is a good start to get rid of the catalyst, and dismantling your foil for a thorough clean on a regular basis, even if you use it frequently, is a must. One other point very worthy of note regarding foils is this: whilst it has got to be acknowledged that the UK windsurfing market is relatively late to the foiling party in relation to others (such as the French market for example), we should also recognise that the windsurfing industry as a whole is late to foiling compared to other industries, such as kitesurfing. Brands like Slingshot, Manta Foils, Naish and Moses have a heritage of foiling in other sports and as such have much to give and teach our industry. There are sure to be others joining in the future, and their influence should be embraced rather than narrow-mindedly scorned for their ‘intrusion’. 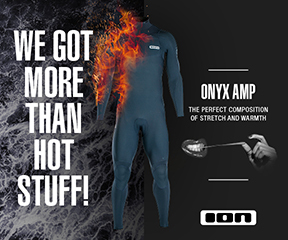 Their inclusion in our sport will accelerate progression and more than this, it’ll bring about versatility in products, where foils can be used for all watersports, from surfing to kitesurfing, windsurfing to SUP’ing. Some of the foils here are already ‘one-foil-does-all’ in design, and surely that is something to consider if you’d like to try foiling in all its various guises. Many of you will be convinced to give foiling a go, but be looking to keep costs to a minimum by scouring the second-hand channels for a cheap board. Initially this seemed a sensible starting point, but we’re hearing of boxes being ripped out of boards more frequently today, purely because more people are trying foiling. So the decision has to be made on whether to go foil-ready or foil-specific. The advantages of foil specific are tangible as soon as you step on – better balance and feedback through the feet, more connection with the foil, easier to pump for early flight and better chance of recovery during unintended touchdowns. And yet for many, a foil-ready board would provide more scope. The ability to put a fin in and use the same board would be a massive bonus if the conditions weren’t right for foiling … and if you windsurf in various locations, the chances are you’ll come across quite a few of these sorts of days. Fixing the foil to the board was once the sole domain of the Deep Tuttle box, but we’re already seeing alternatives, with the kitesurfing brands (Slingshot, Naish and RRD) introducing the pedestal plate and many brands rumoured to follow RRD in the near future by offering a Powerbox option. There will also be a plate adaptor introduced soon so that a pedestal foil can fit any finbox. Time will surely tell whether a Powerbox has the strength to withstand the forces experienced, but for now it is clear that whichever fixing is used, setup and tuning are crucial to a positive foiling experience. The pedestal plate provides a fantastic practical solution for shifting the focus of the foil’s lift and achieving balance. Many foils themselves have tuneable parts – stabiliser wings that can be adjusted – to angle the flight and settle the stance. If none of these are available you then have the default options possessed by all boards – the ability to move footstraps and the deckplate in the track. The key is that you need width in the board’s tail, and suitably inset back strap options so that your heel isn’t off the board or wrapped round the rail. This is vital to control, so some old pin-tailed slalom guns with outboard-only strap options won’t cut it I’m afraid – you have been warned! This is the first foil review we have conducted, so to make sure we don’t lose you when we discuss the nuances between the foils by using unclear terminology; here is a glossary of the test parameters. Early Lift – How early the foil will kick into action and elevate the board clear of the water. Another really important consideration is where the lift comes from – whether it is back-footed, front-footed or balanced between both feet. Directional Stability – A foil is in effect a big fin initially, but when in flight, how directionally stable does it feel? Response – Whilst in flight, you’ll want to control your height through gusts and lulls, on different sea states and during transitions. Response considers your sense of control fore and aft. Speed – Does what it says on the tin, a pretty clear-cut test parameter. Reaching Comfort – Most recreational sailors blast across the wind, from A to B, and wish to do so for hours on end, without a struggle. In powered to overpowered conditions, it is actually one of the tougher points of sail, so how do these foils fair in reaches? Pointing Ability – Just as we’re seeing in the PWA foil racing, the beauty with foiling is the ability to point, both upwind and off the wind. So what is the non-reaching potential of each of these foils? Twitch – This term will be a new one for many and describes the potential ‘play’ in the foil. It deals with any unexplained bounce, jolt or hiccup in the flight – an experience that momentarily rocks your confidence in control. It could be down to a myriad of reasons, but ultimately is likely to boil down to that Holy Grail of foil stiffness. Manoeuvrability – Different to response, manoeuvrability deals with just how playful and throw around you feel the foil is. Does it encourage you to enter transitions in quick succession, or dread them? Ease of Assembly – Most of these foils come fully dismantled. Just how easy is it to put them together and also how easy is it to locate them securely to the bottom of a board? So on to a quick summary of the foils on review here. Firstly there are the low aspect options of the Naish Thrust and Slingshot Hover Glide. Both benefit from the pedestal plate fixing and both give a tremendous amount of lift for flight in marginal winds. The Naish is wonderfully playful and manoeuvre-oriented in nature, whilst the Slingshot is incredibly adaptable thanks to its various mast-mounting options. The two price pointed foils – the Manta Foils Mono and Neil Pryde RS:Flight AL prove that carbon doesn’t have sole rights to wing technology. They are both excellent performers and really put the cat amongst the pigeons, providing excellent value for money. At the other end of the scale are the Starboard Freeride and Moses Vento 91. If you are keen to get serious about foiling, there are no better points of entry. The Starboard foiling collection boasts an interchangeable modular system, whilst the range and speed of the Freeride will keep on giving. The Moses has a similarly impressive range with an extra front wing available should you wish to upgrade. The Fanatic Flow H9 is all about ease and practicality, giving you the best chance of success in your first flights, whilst the RRD WH Flight Alu is a unique offering, blending a mixture of qualities for a fast efficient ride in marginal conditions. That leaves the AFS W85, the only full carbon setup here on test. It is a very eye-catching bit of kit, its alluring form and curvaceous wings matching its glistening material mesh surfaces. It performs beautifully and to cap it all, costs the same as its aluminium counterparts … wow! We’re simply speechless … suffice to say we’re excited about what the future will bring. Watch this space.